Around the world, global warming is starting to have a serious impact on rainfall in the subtropics and middle latitudes. The tropical atmospheric circulation known as the Hadley Cell is expanding toward the poles. This expansion is causing clouds and storms to move further north. And as a result, regions in the middle latitudes are starting to dry out. A changing climate means less rain and lower water supplies in regions where many people live and much of the planet’s food is produced: the mid-latitudes of the Northern and Southern hemispheres, including the U.S. Southwest, southern Europe and parts of the Middle East, southern Africa, Australia and Chile. Such a fundamental shift in global weather patterns due to human-caused climate change is expected to reduce the food and water security of numerous nations. The World Resources Institute recently warned that food and water crises were imminent as a result. And, apparently, these kinds of changes to the world’s weather are already generating profound shocks in parts of the U.S.
For the Colorado River, this combined warming and movement of clouds northward has produced a 16-year-long drought. Hotter average seasons result in greater rates of evaporation. So even if rainfall averages remain, grounds, lands and rivers are drier. But the Hadley Cell’s expansion has also moved rain bearing weather systems north. It’s a compounding drying influence that has pushed Lake Mead, the nation’s largest reservoir, to record low levels. And states dependent on the great river’s water supply for farming and industry are now involved in negotiations to avert a water crisis in 2018. Forecasts predict a 50 percent possibility that Lake Mead’s water levels will fall below its mandatory rationing line. Such an event would result in water cut-offs for Arizona and Nevada. In an attempt to prevent crisis in the coming months, California and other Colorado River states are attempting to cut water consumption now. Such a planned regional belt-tightening would help to avert conflict over the Colorado River’s dwindling stores and smooth out any losses over time. But, sadly, climate conditions are only likely to continue to worsen — increasing the risk of mandatory rationing for 2019, 2020 and beyond. In California, a five-year-long drought that is the worst in state history now threatens to enter its 6th year. Rains during 2016 did help to reduce the severity of drought conditions for some parts of the state. And during recent days, a series of Pacific storms has helped to deliver moisture to some northern and central regions. However, with record warmth settling in over the Arctic and with a La Nina developing in the Pacific, long range forecasts indicate a high risk that California will experience a warm, dry winter. Such predicted conditions would result in a persistence of the present drought with continued impacts to the state’s forests and agriculture. Further east, a flash drought that has settled into the US south is expected to worsen over the coming months. Abnormal warmth in the range of 5-15 degrees (F) above average for the region during the past month has combined with dry weather to spur severe to extreme drought conditions over a six state area. Now, parts of Tennessee, North Carolina, South Carolina, Georgia, Alabama and Mississippi are under the gun — with drought zones expected to persist or expand through at least early February. In total, more than 120 million people in the lower 48 states are experiencing drought. And the systemic impacts of multi-year, persistent droughts are widespread and growing. This drying is consistent with the impacts associated with a warming climate. And, unfortunately, such worsening of droughts is likely to continue until atmospheric warming is halted and/or reversed. Why is Southern California so Dry? First, ocean waters warmed by climate change approach the vast frozen continent. Melt already running out from the continent forms a fresh water lens that pushes these warmer waters toward the ocean bottom. The waters then get caught up in currents surrounding Antarctica that draw them in toward numerous submerged glacial faces. The added ocean heat combines with falling melting points at depth to produce rapid melt along sea fronting glacier bases. Since many of these glaciers sit on below sea level beds that slope downward toward the interior of Antarctica, a small amount of initial melt sets off an inland flood of these warmer waters that then produces a cascade of melt. This glacial melt chain reaction ultimately generates a Heinrich Event in which armadas of icebergs burst out from Antarctica — forcing global sea levels to rapidly rise. Ultimately, seas rising by multiple meters this Century are a very real possibility under current warming scenarios in which such a series of cascading melt events occurs in West Antarctica. Though such a nightmare melt scenario was recently theoretical, it represented a very real potential near-future event as global temperatures rose into the 1-2 degrees Celsius above 1880s range during recent years. For times in the geological past around 115,000 years ago also produced large glacial melt pulses and related sea level rises of 15-25 feet during periods of similar warmth. However, direct evidence of such a powerful melt dynamic had not yet been directly observed in Antarctica’s glaciers. Fresh water lenses were developing, rates of glacial loss were quickening. Basal melt rates looked bad. But the kind of tremendous losses necessary to produce rapid sea level rise were not yet fully in evidence. That situation changed during recent weeks when two scientific papers broke the news that some of West Antarctica’s glaciers had lost upwards of a half a kilometer of ice thickness due to contact with warm ocean waters over the past decade. The studies, entitled Rapid Submarine Ice Melting in the Grounding Zones of Ice Shelves in West Antarctica and Grounding Line Retreat of Pope, Smith and Kohler Glaciers took a comprehensive look at both surface and underside melt of three major west Antarctic glaciers near the Thwaites and Pine Island Glacier systems. These glaciers included Pope, Smith and Kohler — which have seen increasing instability and rates of seaward movement during recent years. Using multiple instruments, the scientists found evidence of massive ice losses and speeding ice flows. The losses occurred at a time when an influx of warmer water (warming circumpolar deep water) was heating the ice shelves and grounding lines buttressing these three partially submerged glaciers. This warming was found to have produced melt along the grounding zones of these glaciers in the range of 300 to 490 meters from 2002 to 2009. In other words, about 1/3 to 1/2 a kilometer of ice thickness at the grounding line was lost in just seven years. Melted away from below by warming deep ocean conditions at the rate of up to 70 meters or around 230 feet per annum. We attribute the different evolution of Smith Glacier to the retreat of its grounding line deeper allowing warmer waters to flood its grounding zone, and increasing ocean thermal forcing due to the lowering of the in situ melting point; as well as to the exposure of the glacier bottom to ocean water as the grounding line retreated rapidly. Unfortunately, numerous glaciers in the Amundsen Sea region including parts of the Thwaites system and the massive Pine Island Glacier also sit on retrograde slopes. These glaciers are seeing increasing fluxes of warm, deep water. By themselves they represent multiple feet of sea level rise (4-7 feet). Furthermore, Thwaites and Pine Island Glacier currently buttress a number of massive inland glaciers that become vulnerable to melt if inland-running retrograde slopes become flooded with warming ocean waters. The very real concern is that Smith Glacier serves as a harbinger for near future events to come. As a result, coastal regions around the world are now under a heightened risk of swiftly rising seas and rapid coastal inundation over the coming years and decades. “I am very afraid for the future of this place. Sooner or later we will have to leave, but we have nowhere to go.” — Buabasah a resident of Fuvemeh, a West African town being swallowed by the sea as reported by Matteo Fagotto. A new, must read, report out in Foreign Policy by Matteo Fagotto highlights a widespread ongoing disruption due to sea level rise to the vulnerable coastal region of West Africa. And, for years now, scientists at the IPCC have been warning that just such an event could occur. The coastal zone of West Africa stretches for 4,000 miles from Mauritania to the Congo. It includes highly populated regions surrounding low elevation cities and towns in such African nations as Gabon, Nigeria, Senegal, Guinea, The Ivory Coast, Sierra Leone, Cameroon, Liberia, and Ghana. Most industrial activity and food-growing is located near the coast of these nations — accounting for 56 percent of GDP for the region according to the World Bank. And coastal population concentrations in regions vulnerable to sea level rise are very high. 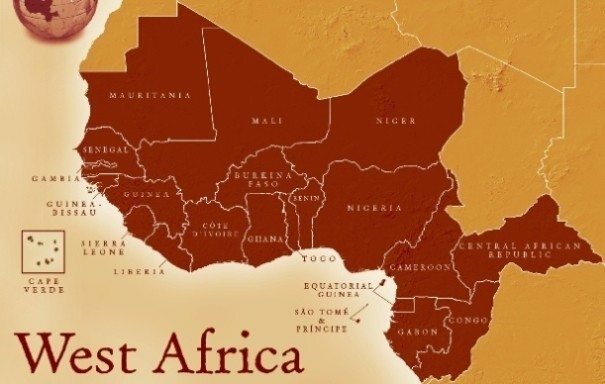 In all about 31 percent of the 245 million people dwelling in West Africa live in this fragile land. Most of the coastline features a lagoonal geography that is very low-lying. Meanwhile, funds for coastal defenses like planting mangrove forests and pumping in sand to re-nourish beaches are difficult to procure. As a result, these large cities and population centers are highly vulnerable to impacts from human-forced climate change related to sea level rise. Ever since the early 1990s, scientific reports have highlighted the vulnerability of West Africa to inundation, flooding and loss of key industries, food growing and infrastructure due to glacial melt, thermal expansion of ocean waters set off by warming, and an increase in storm strength in the North Atlantic. All impacts that scientists feared would be coming due to a human-forced warming of the world. Now, just such an inundation and loss appears to be underway. According to the recent report out in Foreign Policy, and according to other eyewitness accounts and news reports coming in from coastal West Africa during recent years, sea level rise and increasing erosion due to powerful storms continue to produce worsening impacts for the region. In one of the most glaring instances, the swelling surf is now in the process of destroying a Ghana fishing village (Fuvemeh) that recently housed 2,500 people. Homes, coconut plantations, and fishing wharfs have all been taken by the seas and swirling sands. But Fuvemeh is just one of thousands of like communities now confronting an onrush of waves that each year bites off as much as 80-120 feet of coastline. Moreover, Foreigh Policy finds that megacities like Lagos (population 5.6 million) and large cities like Accra (population 1.6 million) are increasingly threatened by the encroaching waters. In Accra, the rainy season now causes an annual inundation of sections of the city — a new impact that resulted in 25 people losing their lives last year. Nouakchott, the capital of Mauritania and home to approximately 1 million people, now sees the loss of 80 feet of coastline along its Atlantic shore every year. Meanwhile, parts of Togo lost 118 feet of shore line last year alone. Along the coast from Gambia to Senegal and including communities like Cotonou and Lome, growing numbers of houses, hotels, restaurants, roads, and even water treatment plants are now little more than washed out husks and crumbling bits of infrastructure — lapped by a rising tide. As the waters rise, residents are forced to move inland. Younger, more mobile residents have often fled the region entirely. Others have rebuilt their homes further inland only to have them flooded again. Ocean productivity is on the decline in the region. Fish and other animals that supported coastal industries have migrated northward or succumbed to worsening ocean conditions. The combined losses have produced economic hardships as coastal cities see increasing gang activity, drug use, theft and violence. Overall, the United Nations estimates that 5-10 percent of West Africa’s GDP will ultimately be lost due to impacts related to sea level rise. And the recent report by Foreign Policy points to growing evidence that the crisis is starting now. But the ever-more-human toll is nothing less than heart-wrenching. Reports by Foreign Policy and others on the plight of coastal West Africa shines a light on sea level rise related hardships and losses throughout that region. However, numerous low-lying stretches of coastline are now facing similar problems. Bangladesh is currently seeing a wave of mass migration inland due to sea level rise related flooding. The Mi Cong Delta region is seeing its rice farms threatened by an influx of salt water. The Indus River Delta region in Pakistan is also experiencing mass migration away from coastlines. Coastal Pacific Islands are facing an existential threat due to sea level rise now. And the U.S. East Coast and Gulf Coasts are facing their own problems from worsening storm surge flooding and more widespread nuisance flooding due to sea level rise. So what we’re seeing in West Africa is part of a much larger overall global context. Ever since human-forced climate change started to kick off dramatically worsening polar warming events in the 2000s, the Arctic has struggled to cool down to normal temperatures during fall and winter. However, for 2016, this failure of Arctic cooling appears to have grown even more pronounced. Over the past few weeks, temperature anomalies for the entire region north of the 66th parallel have ranged between 3 and 5 degrees Celsius above average. These are very extreme departures — ones we typically have only seen during winter when the poleward heat energy transfer effects of human-caused climate change are at their strongest. But this fall, high local ocean temperatures have combined with a north-bound flood of warmth to turn the Arctic into a glaring global hot spot — featuring the highest above normal temperature readings for any region of the Earth. So much added heat has had a marked effect on sea ice. Last week, Arctic sea ice again dipped into record low ranges. Edging sideways away from the usual rapid refreeze trend line, by today these record low readings have become rather prominent in measures like those produced by the National Snow and Ice Data Center (NSIDC). As a result, sea ice extents are today ranging fully 3 million square kilometers below levels seen during the early 1980s. In other words, an area approximately one and one half times the size of Greenland has been lost over the last 35 years. The anomalous heat build-up in the Arctic pushing sea ice levels to new all-time record low daily ranges is, unfortunately, expected to worsen over the coming week. Today’s beyond-normal temperature departures of around 4.35 degrees Celsius above average are predicted by GFS models to rise to around 6.45 C above average by Sunday. These high temperature readings are expected to concentrate in regions near the sea ice edge. And so much heat focusing exactly in the region where sea ice is attempting to expand risks a continued lagging of seasonal ice accumulation. 15-20 C above average temperatures are predicted to stretch from the Beaufort through the Chukchi, into the East Siberian Sea, on through the Kara, down along the Northern Edge of the Barents and into an Arctic Ocean zone just north of Greenland. You can see these extraordinary predicted temperature anomalies in the form of a spiky red swirl surrounding the Central Arctic in the GFS temperature anomaly map provided by Climate Reanalyzer above. So much heat at the ice edge reveals a big battle taking place between powerful oceanic and atmospheric heat transfers into the Arctic and a seasonal sea ice expansion that is fading in the face of a human-forced warming of the world. As of the most recent update from the Joint Typhoon Warning Center, minimum central pressures in Super Typhoon Haima had plunged to 900 hPa. That’s nearly as low as those for Typhoon Haiyan at peak strength (895 hPa). Haima is running in toward the northern Philippines packing maximum sustained winds of 160 mph with gusts to 190 mph (somewhat lower than Haiyan’s peak sustained winds of 185 mph). As a result, we have a storm following a similar track to the comparable strength 2013 super-typhoon which caused so much severe loss and damage during 2013. Like Haiyan, Haima has emerged over much warmer than normal waters in the range of 1-2 C above average temperature. Warmer waters at depth have also helped to allow Haima to reach an intensity that rivals Haiyan as well as aid its potential extreme strength at landfall. Haima also follows just days after a major hurricane strike by Sarika to the south Philippines as a Category 4 storm. An event which displaced 15,000 people and has resulted in the tragic loss of at least 2 lives. Only unusually high ocean heat content and high atmospheric moisture levels — as those that have now become more prevalent due to human-forced climate change — could support such a back-to-back strike by powerful storms of this kind running along similar ocean tracks. Typically, a single strong storm would be enough to deplete the oceanic heat and atmospheric moisture stores that serve as fuel for such intense tropical systems. Through the process of Ekman pumping, storms tend to pull up cooler waters from below the surface and leave them behind in their wake. And this is one of the chief reasons why major hurricanes or typhoons do not typically follow one right after another. But in the new world created by human fossil fuel burning this is less and less the case. Ocean heat and atmospheric moisture fuel for these storms abound. And the waters are warmer at depth, so upwelling of cooler waters can become less of an inhibiting factor. So risks for abnormally intense events are higher. Haima is expected to make landfall in the northern Philippines late on the 19th as a super-typhoon packing 155+ maximum sustained winds, severe rains and an extreme storm surge. Very warm waters in the range of 30 degrees Celsius and low wind shear in Haima’s path also add the possibility for continued strengthening in the 24 hours prior to landfall. As such, this is a very dangerous situation and all interests along the path of this terrible storm should monitor its progress closely and heed any evacuation warnings issued by emergency officials. As the U.S. East Coast is still reeling from impacts associated with Hurricane Matthew, the Pacific Northwest is just now confronting its own potential extreme climate event. For a 4,000 mile long river of moisture streaming off ex super typhoon Songda in the Pacific Ocean is now firing a barrage of storms at Northern California, Oregon, Washington, and British Columbia. A series of storms that could, over the next five days, dump as much as two feet of rainfall over parts of this region. Jet stream winds running across the Pacific now range between 180 and 220 mph. These strong winds are producing a powerful storm track even as they are tapping a vast plume of tropical moisture over the Eastern Pacific. Embedded in this moisture plume is the rain-rich ex supertyphoon Songda. As the strong upper level winds pull in Songda and draw on the extreme moisture bleed rising up off the record-hot waters of the Pacific Ocean, forecasters expect a resulting atmospheric river to run 4,000 miles across the Pacific Ocean and deliver storm after powerful storm to the Pacific Northwest. NOAA model forecasts now show as much as 22 inches of rain falling upon parts of this region over the coming 7 days. However, with so much moisture loading up the atmosphere, it’s possible that locally higher amounts of rainfall will occur. Over the past year, a record hot atmosphere has helped to generate extreme moisture levels aloft. Such record to near record moisture levels have helped to produce 500 to 1,000 year flood events in places like Louisiana, Texas, North Carolina, Maryland, Virginia and in other parts of the US and around the world. This week, record high moisture levels contributed to flooding rains falling over Virginia and North Carolina in association with Hurricane Matthew. Now, a similar extreme moisture pattern is taking aim at the Pacific Northwest. So this is kind of a ‘here we go again’ situation. And, unfortunately, these types of extreme weather events are now more likely due to the fact that a world now in the range of 1-1.2 degrees Celsius warmer than 1880s averages is one in which a higher volume of water evaporates from the land and ocean surfaces and into the Earths atmosphere. Such a physical dynamic related to human-forced warming is one that increases rainfall even as it provides more fuel for powerful storms. Too close to home. That’s the sentence that best describes hurricane Matthew’s impacts — at least for this particular observer. And it’s one that I think we will be saying more and more often over the coming years as sea levels rise and peak storm intensities continue to increase due to a human-forced warming of the world’s atmosphere and oceans. On Thursday, October 6th, as the storm was barreling in toward the Florida coastline, I was on the phone with numerous Florida relatives — somewhat frantically asking if they’d heeded evacuation orders and gotten away from low-lying areas near the ocean. One uncle had decided to hunker down in an inlet-side New Smyrna Beach home about 6 feet above sea level, but the rest had headed inland. Thankfully, Matthew passed just off shore of New Smyrna at low tide — only giving my uncle a bit of a scare by flooding his neighborhood but not completely inundating his house (as would have happened if Matthew had made landfall in that community as a category 4 storm rather than remaining at sea). Further north, my college town of St. Augustine, FL did not fair quite so well. Downtown St. Augustine, which borders the Matanzas River — an estuary of the Atlantic Ocean — saw Matthew sweeping by at high tide. As a result, severe storm surge flooding rose up over the sea wall and put the city’s streets under 3-4 feet of water. Local businesses flooded, a 17th Century Fort that is a tourist attraction saw its moat fill and then overtop, and Flagler College, which I attended during the 1990s, had its grounds soaked. Nearby, parts of Route A1A on Flagler Beach were swept out into the Atlantic Ocean even as the dune line at Jacksonville Beach was breached — precipitating significant tidal flooding through parts of that seaside city. But as with New Smyrna Beach, the situation would have been far worse for St. Augustine and Jacksonville if Matthew had made landfall and not remained off shore. As the storm passed just to the east of North Florida on October 7th, consensus model guidance at the time suggested that Matthew would re-curve out to sea after battering Florida, Georgia, South Carolina and North Carolina, returning for a possible second hit to Florida by about the 13th as a much weakened system. However, Matthew instead took a more northerly track — hugging the coastline. As a result, moderate to severe coastal flooding impacted beach after beach from Georgia and on through South Carolina, North Carolina and Virginia even as heavy rains inundated the region. At Murrells Inlet — a late-summer and early fall reunion and beach-going spot for my family — over-wash from the ocean and tidal flooding from the local inlet pushed 1-2 feet of water into numerous neighborhoods. A local marina from which family members have enjoyed both the scenic view of the inlet and such water activities as kayaking through the teeming waterways to experience close-up encounters with local fish and wildlife was completely flooded out on the 8th of October as Matthew passed (see video above). On the 8th and 9th Matthew also began to hurl its flooding rains and storm surge at my parents’, grandparents’, and sister’s homes in the Hampton Roads cities of Norfolk, Chesapeake, Virginia Beach and Portsmouth. A local river backing up to the Albermarle and Pamlico sounds rapidly filled with storm surge flooding — inundating my parents’ neighborhood and leaving them stranded. Flooding in Chesapeake also stranded my sister in her home. Flooding from heavy rains and a significant storm surge swept into houses on Atlantic Avenue in Virginia Beach near my grandmother’s residence. Downtown Norfolk was shut down by storm flooding (see Granby street image above) and the heavy rains of Matthew combined with a previous severe rainfall event just two weeks ago to produce more than 30 inches of accumulated rainfall over the past 30 days for some parts of Hampton Roads. The result of Matthew’s combined heavy rains and storm surge for the region was never-before seen flooding for many areas — including my parents’ neighborhood. Thankfully, everyone I know is OK. But the same cannot be said for six people living in Florida and Georgia, 14 (and possibly more) people living in North Carolina, and over 1,000 people who are now thought to have lost their lives as Matthew made its first catastrophic landfall in Haiti. There, tens of thousands are estimated to be homeless as a result of the storm which leveled entire forests and towns as it roared ashore packing 130 mph sustained winds. Now, aid agencies are struggling to reach the survivors even as tropical diseases such as cholera threaten to spread in the unsanitary conditions following in the storm’s wake. As a family, my relatives have suffered dislocation and some property damage from the storm. But we are among the fortunate ones. We did not experience the devastating material losses and loss of life that has impacted some in Haiti or North Carolina. However, what we have experienced is a loss of security. We’ve seen floods that have never happened before in the neighborhoods we occupy and in the places we have grown to love and cherish. And we find ourselves wondering what the next Matthew will bring — or the next, or the next. Matthew was an extraordinarily powerful storm whose devastating toll will continue to be counted during the coming weeks and months along its broad and wide-ranging swath. But as we pick up the pieces, respond to the still ongoing disasters in North Carolina and Haiti, begin to rebuild, and try return to semi-normalcy, we should also seriously consider the conditions that helped to spawn Matthew and to bring about its record October intensity. For Matthew emerged over near-record hot waters, formed in a record hot world, and produced its damaging storm surges out of seas that are rising due to human-forced climate change. Matthew’s heavy rains were unarguably pumped up by near record atmospheric moisture levels due to conditions related to climate change. And Matthew’s long, strong intensity was fed by all that climate change related heat and moisture. Like Sandy and Katrina, Matthew was a fore-runner to the worse storms that are now on the way. Storms made worse by our continued burning of fossil fuels and what is a wholesale global dumping of carbon into the Earth’s atmosphere. Until that stops and the Earth starts to cool — freak events like Matthew and Sandy will continue to occur. To grow worse and to have their peak wind intensities pumped higher, their rains intensified, and their storms surges compounded by rising sea levels, larger storm circulations, and stronger wind fields. All throughout yesterday and today the story has been the same — dangerous hurricane Matthew is strengthening in a record-hot atmosphere and ocean environment as it continues to take a course that will result in severe flooding impacts for a massive swath of the southeastern U.S. seaboard. As of 5 PM EST today, the center of Hurricane Matthew was located about 25 miles to the south of Freeport, Bahamas. The storm was tracking off to the north-northwest, making steady progress toward Florida and a large section of the U.S. coastline. Since yesterday, maximum sustained winds have increased from around 120 mph to a present peak wind speed of around 140 mph. More importantly, the storm’s minimum central pressure is falling. As of the 5 PM advisory, the storm’s lowest pressure reading stood at 936 millibars — about 2 mb stronger than Hurricane Sandy’s peak intensity. The National Hurricane Center notes that Matthew may have just gone through an eye-wall replacement cycle, which would result in a brief drop in maximum sustained winds. But pressures continued to drop as the storm got better organized, and now, the satellite picture shows the fearful symmetry of an extremely dangerous storm. As Matthew continues to get more organized, peak wind speeds could continue to rise, hitting 145 mph or higher before ramping wind shear and a long encounter with the U.S. mainland begins to check Matthew’s considerable strength. As Matthew approached the coastline this afternoon, large bands of rain began to cover much of Florida even as onshore winds stiffened. Lake Okeechobee — which is now going through a series of dike upgrades to protect communities east of the lake from storm events like Matthew — is starting to see the effects of these heavy rain bands. With 4 to 8 inches or more of rainfall possible over the Lake Okeechobee region from Matthew (and up to 12 inches or more for parts of coastal Florida), pressure to a dike system needing refurbishment is likely to present serious challenges. Farther north and east, the main story is that Matthew is pushing a Sandy-like storm surge toward a 430-mile section of the U.S. coastline. According to the National Hurricane Center, a region stretching from Sebastian Inlet in Florida north to Edisto Beach in southeastern South Carolina could experience storm surges in the range of 7 to 11 feet. A 700-mile arc from Deerfield Beach, Florida to the Santee River in South Carolina could see surges above 4 feet. Such a powerful storm surge over so large an area would swamp numerous coastal communities already facing the difficulties of human-forced sea level rise, like increasing cases of nuisance flooding at times of monthly and seasonal high tides. As with Sandy, Matthew’s storm surge will rush in upon this higher launching pad resulting from thermal expansion of the world’s waters, glacial melt, and ocean current shifts related to climate change. As a result of Matthew’s continued strengthening over near record-hot waters and a moisture-laden atmosphere, prospects for coastal communities along the storm’s path don’t look very good. A 7- to-11 foot surge is enough to swamp many communities. As we can see in the image above, worst-case potential flooding (1 in 10 probability to exceed) for St. Augustine now puts that city under 3 to 10 feet of water — dramatically worse than last night’s initial storm-surge model estimates of a possible 1-to-9 foot inundation for the city. As Matthew’s expected track runs parallel to the coastline, city after city, from Cape Canaveral to Jacksonville to Savannah to Charleston, faces the potential for similarly extreme coastal flooding as Matthew continues to rush shoreward. Note: This is an increasingly dangerous developing weather situation. Coastal interests from the Bahamas through Florida, Georgia and the Carolinas should stay abreast of forecasts provided by the National Hurricane Center, stay tuned to local weather statements, and remain to respond to possible evacuation/emergency storm shelter information. UPDATE 1245 EST FRIDAY: Hurricane Matthew is still a dangerous Category 3 storm, packing winds of 120 mph and hammering coastal Florida with a 6-to-10 foot storm surge. Early reports indicate that the eye wall of Matthew, winds of 100-plus mph, and a strong storm surge severely damaged the barrier islands near Cape Canaveral as Matthew brushed by. Extensive flooding and damage has also been reported in the New Smyrna/Daytona Beach area. Of greater concern is the fact that Matthew’s strongest effects are approaching St. Augustine and Jacksonville at or near the time of high tide. Already, reports are coming in of severe flooding in parts of both of these cities (see image above). Hurricane Matthew has already been a storm for the record books. Matthew was the lowest latitude Category 5 storm to form on record in the Atlantic basin. An achievement that bears testament to the amount of heat energy the storm was feeding on — as higher latitude storms can better leverage the Earth’s spin to increase wind speed. It was the longest lasting Category 4-5 storm on record in the Caribbean. And it produced the highest accumulated cyclone energy (ACE) of any hurricane on record for that sea. This powerful hurricane has consistently fed on sea surface temperatures in the range of 29 to 30 degrees Celsius (84 to 86 Fahrenheit). These waters are 1-3 degrees Celsius above 20th Century averages and are at or near record hot levels. Furthermore, added heat at the ocean surface has led to greater evaporation which has contributed to 75 percent relative humidity readings at the middle levels of the atmosphere. Such high levels of heat and atmospheric moisture are not normal. They provide an excessive amount of fuel for powering intense hurricanes like Matthew. And all this heat and moisture is now made more readily available by a record hot global environment resulting from the ever-rising levels of greenhouse gasses in the Earth’s atmosphere due to fossil fuel burning. Yesterday this heat-fueled storm vented its fury first on Haiti and then on Cuba. But as the rains fell at rates of up to 5 inches per hour and as the winds howled in at 145 mph, the mountainous terrain of these two islands took its toll on Matthew’s circulation. According to Dr. Jeff Masters, Matthew’s eye wall was disrupted and partially collapsed as the storm tracked over rugged eastern Cuba. As a result, its peak intensity dropped off from 145 mph early Tuesday to around 115 mph or a minimal category 3 storm during the morning on Wednesday. But Matthew has since re-emerged as a major hurricane over very warm waters near the Bahamas and it is again drawing on a nearly unprecedented supply of ocean heat and atmospheric moisture. As a result, the storm is rapidly re-strengthening. Thunderstorms around the center are rising again to towering heights. Pressures are dropping and peak wind speeds are starting to pick up. By tomorrow morning, it’s entirely possible that Matthew will have returned to Category 4 status — boasting a very large circulation and sustained winds in excess of 130 mph as it starts to threaten the Florida coast. As of 5 PM EST on Wednesday the storm had already regained some intensity — hitting 120 mph maximum sustained winds. Model guidance puts the storm near or over the Coast of Central and Northern Florida by Friday morning with some models (ECMWF) showing a minimum central pressure near 940 to 945 mb by that time — representing a very powerful storm with winds possibly again exceeding 145 mph. Matthew is predicted to run parallel to the coast, with part of its circulation remaining over water. As a result, the storm could maintain intensity even as it drives hurricane force winds and strong storm surges into multiple cities and towns along the coast. The subtropical ridge over the western Atlantic is still strong, and the flow pattern around this ridge should continue to steer the hurricane toward the northwest during the next day or two with no significant change in forward speed. After that time, the ridge will shift eastward, allowing Matthew to move northward very near or over the north Florida east coast, and then near or to the east of the Georgia and South Carolina coasts. Such a path would tend to keep Matthew strong for a longer period of time. In addition, movement along the coastline could result in severe impacts ranging over a very large region — not just focusing on a particular section of the shore, but running along the oceanfront for hundreds of miles. In the worst case scenario for Matthew, diverse regions from Cape Canaveral to Jacksonville to Savannah all experience significant hurricane impacts including major hurricane winds and severe storm surge flooding. But if the current forecast isn’t rough enough, the long range looks even worse. Model guidance is now starting to form a consensus that Matthew may not immediately head out to sea following its first encounter with the US East Coast. In fact, models like GFS, ECMWF and CMC are indicating that Matthew may loop back, possibly even striking Florida a second time by Wednesday (GFS). Though highly uncertain, the possibility of Matthew returning to the warm water environment that so greatly added to its strength initially, before hitting Florida a second time, was enough to draw some pretty strong words from experts like Dr. Jeff Masters over at Weather Underground earlier today. Thanks to my advancing years and a low-stress lifestyle that features daily meditation, there’s not much that can move me to profanity—except the occasional low-skill driver who endangers my life on the road. But this morning while looking at the latest weather model runs, multiple very bad words escaped my lips. I’ve been a meteorologist for 35 years, and am not easily startled by a fresh set of model results: situations in 2005 and 1992 are the only ones that come to mind. However, this morning’s depiction by our top models—the GFS, European, and UKMET—of Matthew missing getting picked up by the trough to its north this weekend and looping back to potentially punish The Bahamas and Florida next week was worthy of profuse profanity. Such a loop back and second hit to Florida and the Bahamas is highly uncertain at this time. However, given all the heat and moisture available, there’s a possibility that Matthew could re-strengthen along such a path after the significant wind shear predicted Sunday and Monday subsides — bringing forward the possibility, however unlikely, of the same storm striking Florida and the Bahamas twice as a major hurricane over the course of 5-7 days. It would be a very odd and unfortunate event if it did happen. One that would have been fueled by all the climate change related hot water and near record moisture readings sitting at the ocean surface and rising on up into the middle levels of the atmosphere. But given the storm now blowing up over the Bahamas this evening, a possible first strike is already looking rough enough. Note: This is a potentially highly dangerous developing weather situation. Coastal interests from the Bahamas through Florida, Georgia and the Carolinas should stay abreast of forecasts provided by the National Hurricane Center and stay tuned to local weather statements and/or possible evacuation/emergency storm shelter information. It’s fall. The Arctic is trying to cool down, but what would typically be a steady decline into frigid temperatures is being held back by the increasingly strong hand of human-forced climate change. Over the past month, temperature anomalies for the entire Arctic have ranged near 3 degrees Celsius or more above average. These temperatures appear to have represented the highest departures from average for any world region for the past month. Overall, they’ve greatly contributed to what is likely to be another record hot month globally. Into the first week of October, this trend is expected to intensify. By Friday, according to GFS model runs, temperatures above the 66° North Latitude line are expected to range near 4.5 C (8 degrees Fahrenheit) above average for the entire region. Meanwhile, areas of Greenland, the Arctic Ocean and Northeastern Siberia are expected to see 10-18 C (18 to 32 F) above-average temperature departures for the day. It doesn’t need to be said that these are extraordinary warm temperature departures from normal, which represent near-record or record warm ranges for many locations, but this is what we would expect with human-forced climate change. As the sun falls in the Arctic sky and night lengthens, energy transfer in the form of heat coming in from the warming ocean and atmosphere intensifies. This effect is driven by what is now a great overburden of greenhouse gasses in the Earth’s atmosphere. Powerful heat transfers slowing down the rate of fall cooling in the Arctic came amid what is likely to be the hottest September in the global climate record. Australian scientist Nick Stokes found that September temperature departures were about 0.05 C higher than August’s record temperature departures. Translated to NASA GISS figures, if they were to match this increase, September values would fall around 1.03 C hotter than NASA’s 20th-century baseline and about 1.25 C hotter than 1880s averages. Temperatures in these ranges would represent the hottest September on record by a pretty big margin (about 0.13 C globally). Meanwhile, the annual averages for the first nine months of the year would hit near 1.27 C above 1880s averages if the NASA measure saw a warming similar to that showing up in Stokes’s early NCEP/NCAR reanalysis figures — a measure disturbingly close to the 1.5 C departure levels that represent the first major global climate threshold, a level that many scientists have advised us we’d be wise to avoid.